. استمتع بالخدمات الراقية والضيافة التي لا مثيل لها بهذا الفندق في جولد كوست. تتضمن الميزات الرئيسية في هذا الفندق: خدمة سيارات الأجرة, مجهز لذوي الإحتياجات الخاصة, مطبخ, تخزين الأمتعة, صف السيارات. في الفندق غرف نوم يتجاوز عددها 30، كلها مجهزة بعناية وجمال وبعضها مزود بـ تلفزيون بشاشة مسطحة, مكيف هواء, مكتب, شرفة/ تراس, تليفون. يقدم الفندق مجموعة واسعة من وسائل الراحة المتنوعة، كمثل: مركز للياقة البدنية, ملعب جولف (ضمن العقار), مسار جولف - ضمن 3 كم, حمام سباحة خارجي, حديقة. اكتشف مزيجاً ساحراً من الخدمة الاحترافية والخيارات الواسعة من وسائل الراحة والمتعة في Signature Waterfront Apartments. Great location, beautiful surroundings and views, will definitely stay there again in the future. We checked out the rooms prior to our stay. And we where shown our room which was beautiful and clean. Once we checked in the room was different, dirty, and all furniture was chipped or dirty. Aircon didn’t work and we spoke to the manager to find out that they have changed hands. I think since changing hands it has gone downhill. Main bed was quite hard to sleep on. Ended up getting the matress from the sofa to put on to make better but still not a comfortable bed... and the windows that led from the bedroom into the bathroom lacked privacy curtain. Other then that everything else was great..
Lovely view of Golf Course, nice and big-sized apartment with well-prepared cooking tools......highly recommended to those travelling with a car since the location is quite remote. Excellent professional service by John on Reception. We requested the top floor and were given a top floor apartment with lovely sweeping views over the golf course. Lovely modern, quiet apartments. Highly recommend. Very short drive to Surfers and close to main highway to Brisbane/Theme Parks/Gold coast Airport (20 mins drive). Everything is perfect,only downside is not too easy to get a coffee at the morning, no shops around maybe could put a pod coffee machine in the room. But definitely will come back when we visit gold coast. Beautiful and very spacious apartment in a secure gated compound. Lovely manager, accommodated our requests for a higher floor as I had my sister and her partner visit from America and we wanted them to see some city views. Very large apartment, fan in the second bedroom a bit dusty, but otherwise wonderdul. 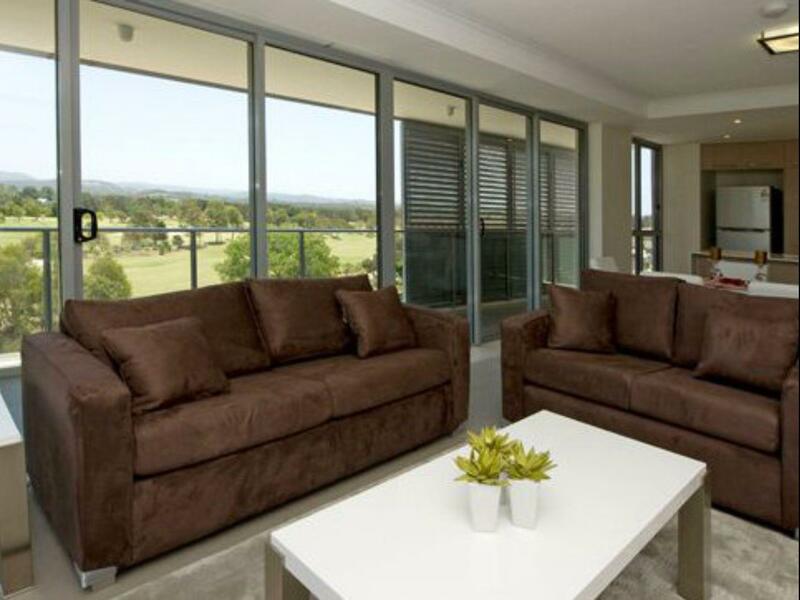 very nice view of the apartment which situated nest to a Golf course. Will definitely stay there again in the next visit. My mum and I chose this apartment. There are huge lawn outside and the room is so nice and clean. Love it. Location was great. Great space in the apartment however the linen was stained, the walls had marks all over them. The dining table chairs were torn. One of the aircon remotes didnt work & had sticky tape holding it together. One of the single beds had a massive dip in it so you could feel all the springs in it which lead to my hubby waking up with a sore back. Overall very disappointing. It could of been great if cleaned & a little bit of money invested into it. Clean and specious, really good value for holiday stay. Highly recommended. Very convenient for accessing popular tourist spots and great setting. Plenty of room and facilities. We were very surprised when we drove down the gated community. It was very secure and safe. The unit was very large and well appointed. The only thing is there was a lack of blankets and towels but this is easy fixed and would have been if we were staying longer. Beautiful view overlooking at the golf course. great location to drive to all major theme parks, attractions & shopping cenrtres nearby. Excellent customer service provided by the apartment manager John with the personal touch. Just make sure if you late check in, tell the manager. Specially in weekends.